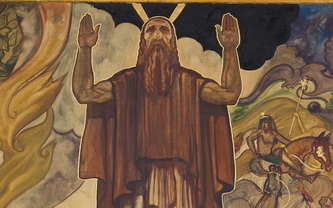 Mural Description From the Lectures of Rabbi Edgar F. Magnin, 1929-1930: "The figure of Moses is one of great dignity. His arms reach heavenward as a symbol of hope and prayer. Rays of light emanate from his head. In back of him are clouds. On the left below him are the Hebrews who crossed the red Sea in safety; on their right are Egyptian horses, chariots and their riders are being hurled into the mighty waters." "In the second section of the mural, "Joshua and his soldiers carry their spears; below him the walls of Jericho are crubling. The next figure represents Samson pushing down the pillars in the Temple of Dagon with great physical strength. To the right King Saul is between two oxen, threatening his enemies, as described in the Samuel 5:11 in the Bible." The Hero’s Journey is reflected in the narrative of many Bible stories. The Hero’s Journey is a pattern of human experience reflected in literature and film. The stages of the Hero’s Journey usually follow a standard sequence. Challenges we face on our own life journey can offer potential for personal growth. What can we learn from our Jewish heroes? How can our own lives be viewed in terms of a "quest narrative?" How can a person mature and change through taking heroic action? Read in Primary Text: Understanding Jewish History 1, Sol Scharfstein, Ktav, 1996. The First Hebrews, page 9; The Promised Land, page 21. The Hero’s Journey is a pattern of storytelling that appears in ancient myths, biblical stories, legends, novels and films throughout history. This pattern of story was identified by an American scholar named Joseph Campbell who loved reading about legends from around the world. Through his reading, he noticed a similar journey that all heroes in all stories took, no matter where or when they lived, or who wrote the story! 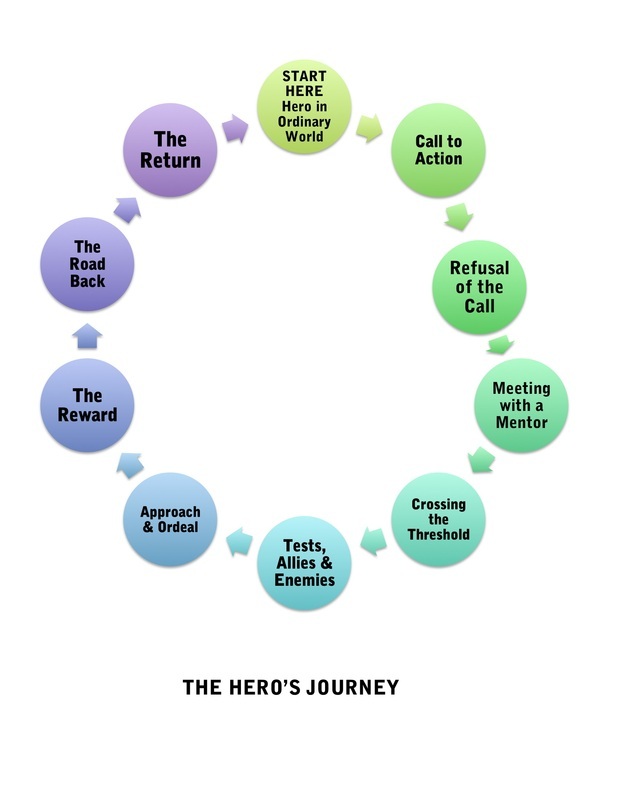 In the "Hero’s Journey" the hero goes on a “call to adventure.” Along the way there are ordeals and challenges, tests and rewards. When they finally return to the world they left, a transformation has occurred. This repeating journey has been called the "monomyth"--"mono" a greek prefix for "one." The Hero’s Journey influenced writers and movie makers, often whether they realized it or not. Some of the well known movies that follow this story pattern are Star Wars, Lord of the Rings and the Hobbit, Karate Kid, the Lion King and the Hunger Games. 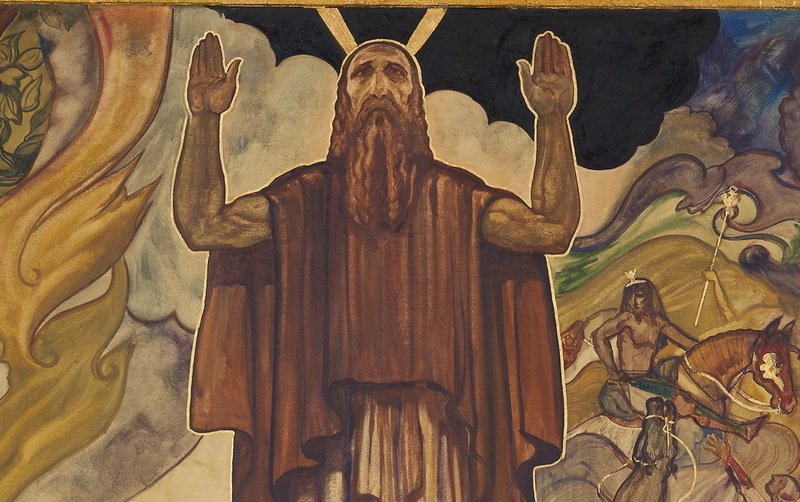 As our class journeys through 3500 years of Jewish history we are going to look at a section of the mural that focuses on four strong men: Moses, Joshua, Samson and King Saul and explore the heroic journey they embarked on through this monomyth. 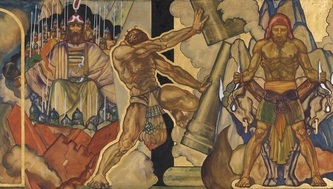 PROJECT THESE IMAGES FROM THE MURAL: MOSES, JOSHUA, SAMSON & KING SAUL--each showing their strength. First we will understand more about the different stages of the universal hero's journey, and the different types of heros. Then we will work in groups to look closely at, and understand the lives of these Biblical heroes and what we can learn from their journey. In his study of world hero myths Joseph Campbell discovered that they are all basically the same story – retold endlessly in infinite variations. He found that all story-telling, consciously or not, follows the ancient patterns of myth, and that all stories, from jokes to the highest literature, can be understood in terms of the hero myth. The theme of the hero myth occurs in every culture, in every time; in endless varieties. These stories are are powerful because they are reflect universal concerns and questions: Who am I? Where did I come from? Where will I go when I die? What is good and what is evil? What must I do about it? ACTIVITY #1: WHAT MAKES A HERO? Make a list of current living heroes on the board. Make a list of fictitious heros on the board. Who do you personally know that could be considered a hero? Explain. What do these heros have in common? What makes their actions heroic? Now let's watch this 4 minute video that explains the Hero's Journey. The filmmaker shows that the hero's journey includes stages on a journey that all heroes share. He uses a clock image to describe the cycle. He also makes it clear that people learn from trial and error on this journey--- making mistakes, overcoming fears, meeting a challenge, etc… Through this process we become wiser and more mature. By following heroes--whether in film, novels, or in the Bible, we understand the very human challenges people face at different times; their journeys provides examples for what, or what not to do, along the way. The narrator of this video states that we all can experience aspects of this very human hero's journey in our own lives. Take a few minutes to consider some of the stages of this journey in our own lives. Read together the prompts below and chose one. Take 5 minutes to quickly write about your experience. When the time is up turn to a partner and both share what you wrote. WRITING PROMPTS -- Choose one experience you have had that you would like to write about and share. Select one prompt, take five minutes to do a “quick write.” When the teacher tells you, turn to a neighbor and take turns reading each other what you wrote. Ask your neighbor one or two questions after hearing their story. Describe an experience or event you participated in that made you feel more mature and / or wise. Write about a time you felt you needed to “make a change” in your life. Describe a time you felt a “lucky charm” made a difference in your life. Describe a time you wanted to do something, someone stopped you, and you are glad they did. Describe a time someone pushed you to do something you didn’t want to-- but you are now glad they did. Describe a time you really appreciated someone’s help. Describe an experience that has given you a new way of looking at life. Describe a skill, gift, or talent you have that you can use to help others. After sharing, project the image below and show the stages of the Journey. Ask students look at the diagram of the journey, think about the movie they just saw, and place the experience they just wrote about on the wheel. Use the chart below, describing the Stages. Clarify vocabulary as needed. THE ORDINARY WORLD. The hero is presented in his or her world, so we get to know the kind of person he/she is. THE CALL TO ADVENTURE. The hero is presented with a problem, challenge or call to something greater than him or herself. Something shakes up the current situation so the hero must face the beginnings of change. REFUSAL OF THE CALL. The hero feels the fear of the unknown and tries to turn away from the adventure, however briefly. MEETING WITH THE MENTOR. The hero comes across someone to advise or guide him/her with training, equipment, or advice that will help on the journey. Or the hero reaches within him/herself to a source of courage and wisdom. CROSSING THE THRESHOLD. The hero commits to leaving the Ordinary World and entering a new region or condition with unfamiliar rules and values. TESTS, ALLIES AND ENEMIES. The hero experiences further problems to test him along the way. APPROACH & ORDEAL. The hero and newfound allies prepare for the major challenge; Near the middle of the story, the hero confronts death or faces his or her greatest fear. Out of the moment of death/fear comes a new life. THE REWARD. The hero takes hold of the treasure or knowledge or "new life" that he won by facing death/fear. THE ROAD BACK. About three-fourths of the way through the story, the hero is driven to finish the adventure, deal with unseen consequences of his reward, resolves final conflicts and make sure the treasure is brought home. Often a chase scene signals the urgency and danger of the mission. RETURN. The hero returns home, or completes the journey, with the new knowledge, or an object, to benefit or transform both him/herself and the ordinary world he is now returning to. LET'S LOOK AT THE HERO'S JOURNEY AS PORTRAYED BY THE BIBLICAL HEROES IN THE MURAL. Introduction: Introduce these Biblical figures through the lens of the Hero's Journey. Show the Hollywood film clips below and discuss how Hollywood has portrayed these heroes. 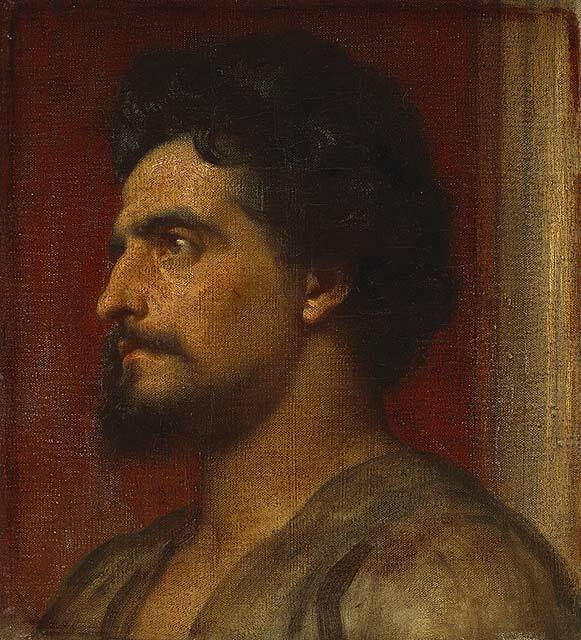 Reference the Gallery of Works of Art and ask students to discuss how artists through the ages have depicted these heroes. Students will work in small groups and select one of the Biblical Heroes below. They will read about their life using the primary text, Understanding Jewish History or from the Torah. Students will complete a Graphic Organizer to help them understand the stages of the Hero's Journey as reflected in the life of their Biblical Hero. The final assessment will be a collaborative Visual Map that creatively presents the journey of their Biblical Hero. Teachers will model the Hero's Journey with the whole class through the journey of Moses. 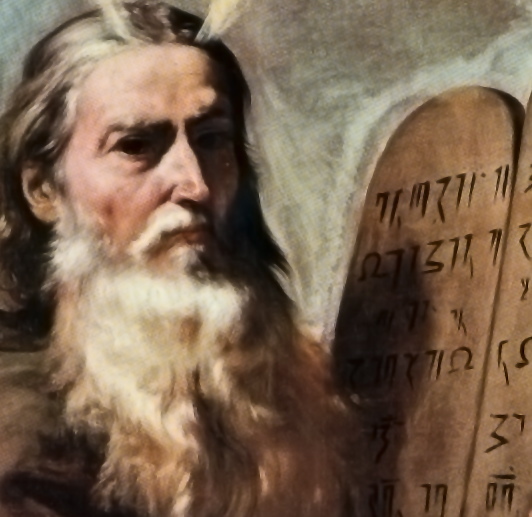 Read sections of Torah that correspond to scenes in film and discuss. Show Galley of Images of Moses: What different aspects of Moses' character and stage of the journey did the artist focus on? STAGES OF THE BIBLICAL HERO’S JOURNEY: Students, individually or in pairs will choose a Biblical hero, learn about them, and compile a Graphic Organizer to outline their journey. Click Here for Graphic Organizer. VISUAL MAP OF THE BIBLICAL HERO’S JOURNEY: In groups, students will create four poster size Visual Maps--one for each Biblical Hero. Assign each student a specific Hero and piece of the journey to illustrate: Names and symbols of the key places they journeyed, drawings of important scenes, people they met, cut and paste Images from the Art Gallery, etc. to creatively illustrate the journey. Look at examples of creative visual maps for ideas for organizing the material. 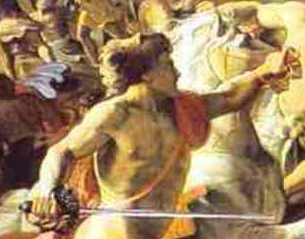 RECOGNIZING DIFFERENT TYPES OF HEROES: Which type of hero is Moses, Joshua, Samson, Saul? • journey takes them to unknown land far from home separate from group lone adventure in the wilderness away from the group which they eventually rejoin. Understanding Jewish History, Pages 12-18. Read the Story of Samson Understanding Jewish History, page 25.
Who has seen these films before? What emotions does the film clip bring up? After watching these film clips, in what way does Hollywood present the hero figures of Samson and Moses? Is it how you pictured them?